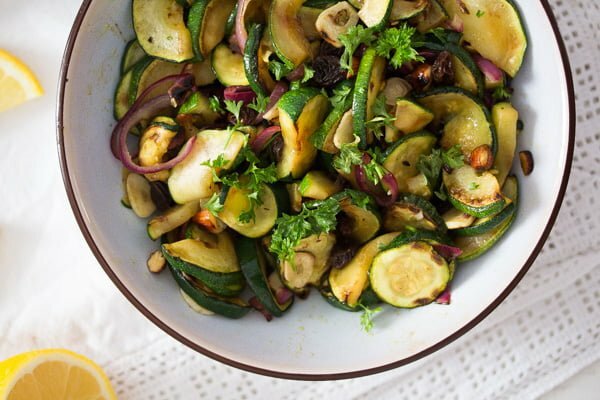 Delicious skillet zucchini with onions and garlic, an easy recipe for sauteed zucchini in olive oil with raisins and almonds. What an easy and wonderful sauteed zucchini recipe this is! I was so impressed by it the first time I’ve cooked it, that I couldn’t stop telling about it to just about anyone around me for several days. And I cooked the skillet zucchini 3 times during that same week. But I have to say, they have both been brave children and ate everything I have cooked with zucchini until, even the curry, but enough is enough… this particular sauteed zucchini they would not touch! It is really not a dish for children, I mean pure veggies with raisins and almonds, I would like to meet the child who would eat that willingly. 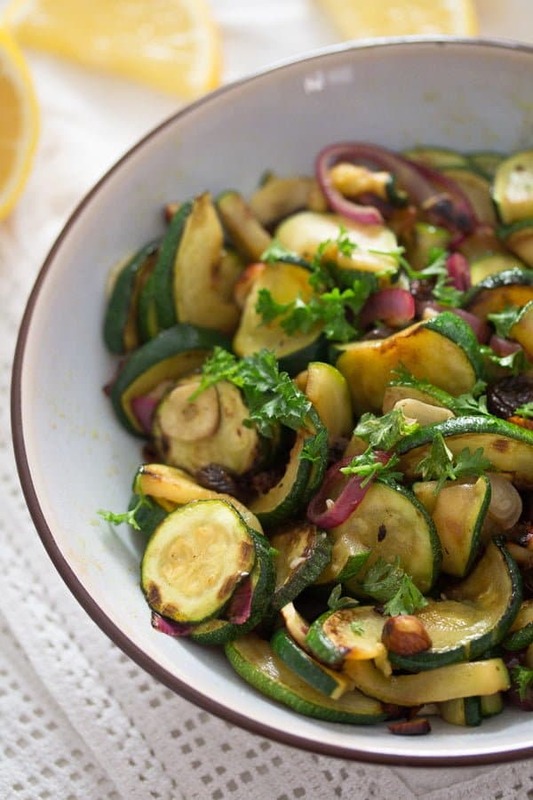 But for us, adults, these sauteed zucchini recipe is heaven. 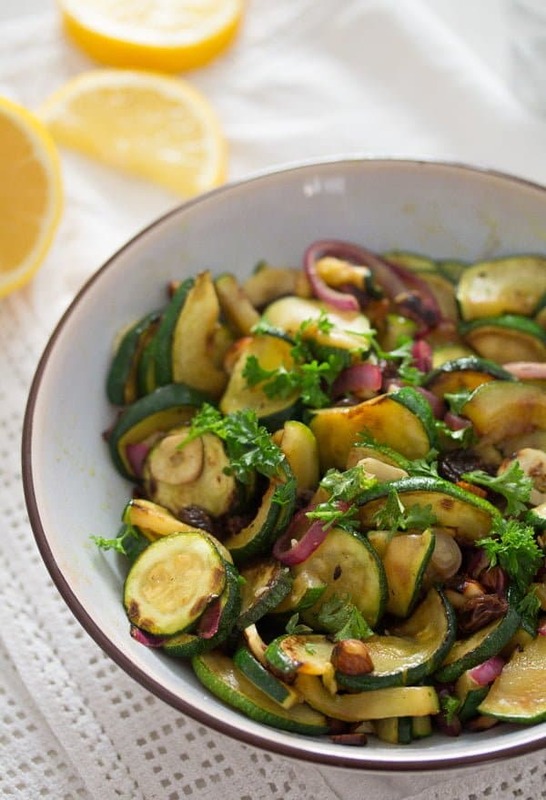 So much flavor, aromatic zucchini, sweet raisins and red onions, a slight garlic aroma, lemon and herbs. And then the texture of the dish: zucchini which still have a bite, soft onions and raisins and the crunch given by the roasted almonds. So good! 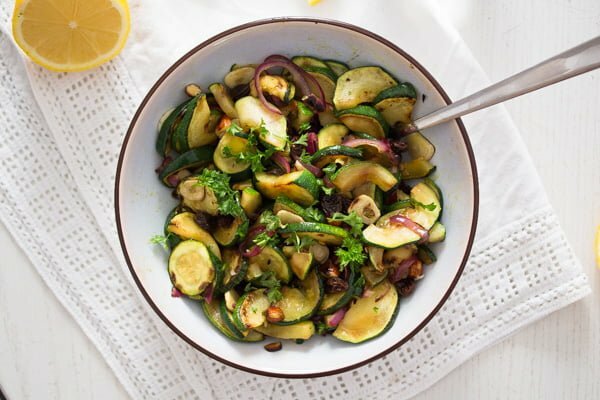 The list of ingredients might seem long for just a simple sauteed zucchini and onions recipe, but don’t let that put you off from cooking these skillet zucchini. They are all ingredients you probably have in your cupboard anyway, basic things like garlic, raisins and almonds. I know I did not have to go buy anything special to cook this skillet zucchini. First of all you will need some zucchini. Smaller, thinner zucchini would be perfect, due to the fact that they are thin, you will be able to cut them into pretty rounds and the dish will look just stunning at the end. If using young zucchini, removing the seeds is definitely not necessary. But if all you have are larger zucchini from the garden, don’t worry about it, the dish will taste just as amazing. 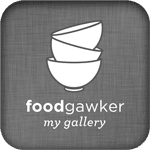 In this case, halve the zucchini lengthwise, scoop out the seeds with the help of a teaspoon (if necessary, if there are too many of them and too many of them making the middle of the zucchini soft and mealy) and slice the zucchini halves into halve moons. I used red onions for this dish, they look very pretty again, but regular onions can be used instead. The raisins are a must if you ask me. I rarely use them in cooking, so I had considered leaving them out at first. But then I used them anyway and I am so glad I did, they definitely belong in this sauteed zucchini recipe. The original recipe calls for pine nuts. However, pine nuts are an item that I don’t usually have in my pantry. They are rather expensive and have a rather short shelf life, so I prefer to buy them fresh if I ever use them. So, I used almonds instead and didn’t regret it, they were just wonderful. 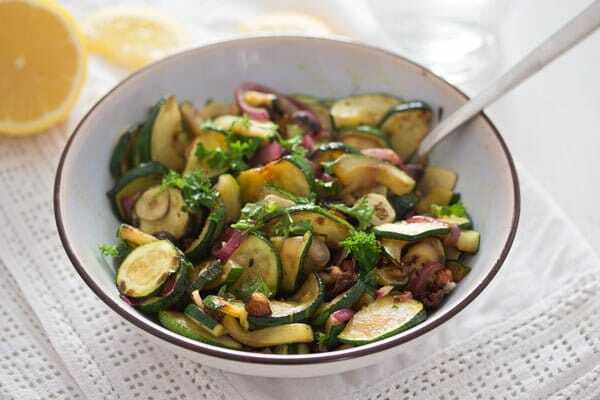 But if you like, do use pine nuts, I am sure they would be delicious in this sauteed zucchini and onions dish. The original recipe also calls for mint. I would have had some in the garden, but somehow I just didn’t feel like it, so I used parsley. Do use whatever you like best. I am obsessed with cookbooks, have I ever told you that? I must have over 300 hundred now… Not counting recipe magazines. So, the main thing about this recipe is sauteing the zucchini. That is a pretty basic procedure, when wanting to saute zucchini start here and go on with the recipe, either this recipe for sauteed zucchini and onions or any other recipe including sauteed zucchini. First of all, slice the zucchini. As mentioned above, smaller thinner zucchini are perfect for this recipe. If using those, cut the zucchini into slices, Diane Henry says the zucchini slices should be as thick as a British pound coin. In case you have never had a pound coin in the hand, that would be about 3 mm/0.11 thick. No need to remove the seeds if using young and thin zucchini. If using garden zucchini, which tend to overgrow you will have to halve the zucchini lengthwise. If they are still too large, you can quarter them as well. Such large zucchini have lots of seeds as well, making their interior rather soft and mealy. You will definitely not want to have all those seeds into the sauteed zucchini and onions, so do remove the seeds. The easiest way to do that is to take a teaspoon and scrape out the soft part of the zucchini’s insides containing the seeds. Discard those. After removing the seeds from the thicker zucchini, slice the halves (or quarters) into slices as thick as mentioned above. To perfectly saute the zucchini, I prefer to do that in a large skillet or large non stick pan and in batches, if necessary, not crowding the pan too much. Heat 1 tablespoon olive oil in the skillet and give about half of this quantity of zucchini to the skillet. Fry the zucchini until golden on the underside, flip carefully using a spatula and continue frying them until golden on the other side as well. Remove from the skillet or the pan. Fry the remaining zucchini slices the same way, adding one tablespoon more olive oil oil to the skillet or pan before adding the zucchini. Give all zucchini slices to a bowl and continue with the recipe. Actually, before even starting sauteing the zucchini I use the same pan or skillet to roast the almonds. I do that at the very beginning because the almonds need to be roasted in the clean pan without the addition of fat. So, roughly chop the almonds and roast them in the hot skillet or non stick pan for a few minutes, shaking the pan often in between and making sure that the almonds don’t get burned. This will only take a couple of minutes, stand by and remove the almonds from the pan as soon as they are golden and fragrant. 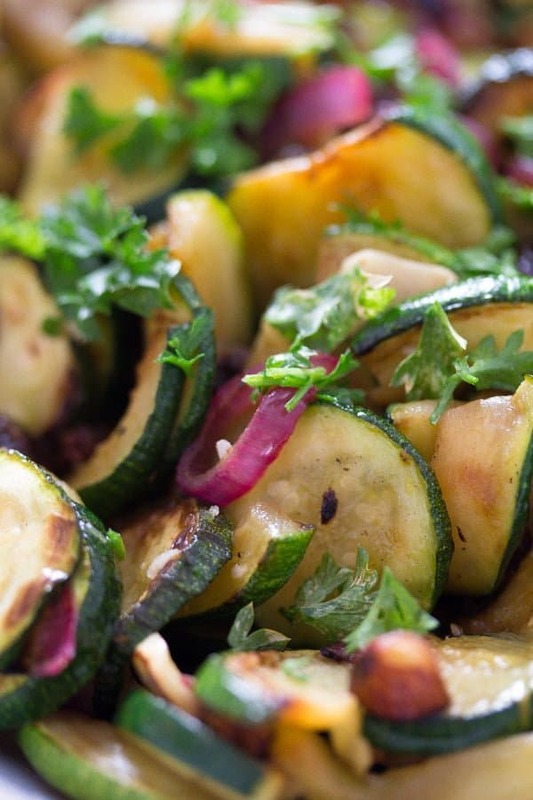 Let cool on a plate while you cook the sauteed zucchini recipe. If using pine nuts instead of almonds, roast them exactly the same and pay even more attention, they burn even quicker than almonds. Also, before starting with the zucchini, give the raisins to a small bowl and cover them with boiling water. Let them soak while you do the rest. Prepare the zucchini as instructed above and saute them in the skillet or non stick pan. Remove and give to a bowl. Heat another ½ tablespoon olive oil in the same skillet and cook the sliced red onions until very soft. Add the garlic, stir for another minute or two and give the cooked vegetables to the bowl with the zucchini slices. Toss carefully, add the drained raisins, lemon juice and chopped parsley (or mint). Toss again, adjust the taste with salt, pepper and more lemon juice, if necessary. Add the roasted almonds (or pine nuts) just before serving, so that they will remain crunchy. 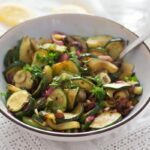 You can serve this sauteed zucchini recipe either warm or at room temperature, I have actually had it at room temperature more often than not. The skillet zucchini make a great side dish for chicken breast, for instance. However, I have had them most of the times on their own with a slice of crusty bread or, my favorite version, with a very large dollop of hummus or fava bean dip. Soooooo goooood! This recipe for sauteed zucchini and onions serves 4 as a side dish and 2 as a main dish with bread and hummus, for instance. The calories are calculated for 4 servings. Chop the almonds roughly. Heat a large skillet or non stick pan without adding any fat and roast the almonds until golden and fragrant. Stand by the pan and shake it often to avoid the almonds from burning. Give the almonds to a large plate and leave to cool while you continue with the recipe. Pine nuts can be used instead and roasted in the same way. Give the raisins to a small bowl and cover with boiling water. Let soak until needed. If using medium zucchini slice them into rounds about 3 mm/ 0.10 inch thick. If using large zucchini, halve them, remove the seeds with the help of a teaspoon and slice the halves. Heat 1 tablespoon olive oil in the skillet or non stick pan you used for roasting the almonds. Add about half of the zucchini and fry until golden on the underside. Flip with a spatula and continue frying them until golden on the other side as well. 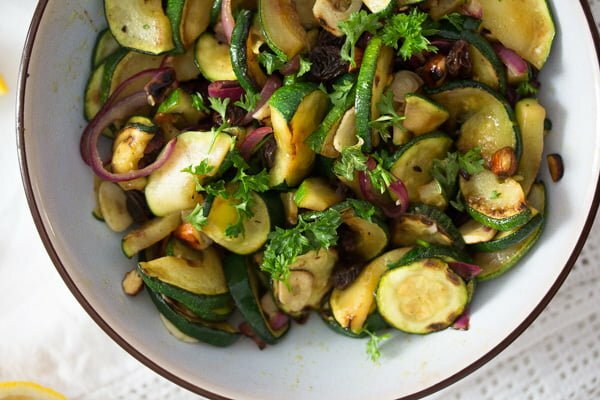 Give the sauteed zucchini to a serving bowl. Add another tablespoon olive oil to the pan and fry the second batch of zucchini exactly the same way. Give to the bowl as well. In the meantime, halve the red onion and slice the halves. Slice the garlic cloves as well, but keep the two vegetables separate. Give another ½ tablespoon olive oil to the pan. Cook the onions until very soft. Add the garlic and continue cooking for another minute or two, stirring, until the garlic is golden and fragrant. Give the onions and garlic to the bowl of zucchini. Drain the raisins well and add them to the sauteed zucchini. Add the lemon juice and the chopped parsley (or mint). Toss carefully and adjust the taste with salt, pepper and more lemon juice, if necessary. Sprinkle the almonds on top just before serving. Serve as suggested above. Note 1: The same amount of pine nuts can be used instead. Note 2: If using large garden zucchini, you will have to halve them and remove the mealy interior containing the seeds. Do that with the help of a teaspoon, scraping out the soft insides and leaving only the crunchy zucchini flesh. After removing the seeds, slice the halves. Note 3: You can use a few sprigs of fresh mint instead, if you like it. You know Adina – your recipe are never boring. A summer squash dish with almonds and raisins? Very creative and one I need to try. We’re growing yellow zucchini which I would think would still work with this dish. Sounds so good!